Apex Legends cross platform play is a hot topic as of late. Everyone wants to be able to play Apex Legends with their pals on other platforms, and since Fortnite can do it, why not Apex Legends? Thankfully however, Respawn has confirmed that Apex Legends cross platform play is in the works and eventually, it will be possible. So is Apex Legends cross platform? Not yet, but it will be at some point, and we've got everything we know about Apex Legends cross platform play here. Is Apex Legends cross platform? No. Not yet, anyway. But Respawn's lead producer Drew McCoy confirmed in an interview with Eurogamer that Apex Legends cross platform is in the works, and that they plan "to allow players to play with their friends on other platforms" at some point in the future. Currently, Apex Legends is only available on PC, PS4, and Xbox One. Unlike Fortnite, players on each platform cannot party up and play alongside one another, which makes it frustrating for groups that have players with different platforms in their ranks. In the aforementioned interview, McCoy all but confirmed that Apex Legends cross platform progression won't be a thing, "due to the way systems were set up early on" which "can't [be] reconciled after the fact." It's promising to know that Apex Legends cross platform play is on the way at some point, but there's no confirmation whatsoever on when it will arrive. All we know is that Respawn is working on it. 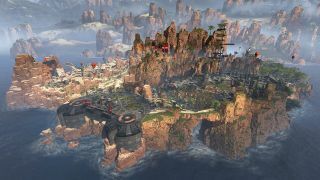 How will Apex Legends cross platform work? There's no confirmation on exactly how Apex Legends cross platform play will work, but it's highly likely they'll implement a similar system to Fortnite. Origin/EA accounts - much like Epic Games accounts - can be used in the back-end to manage your friends list, invite players and all the good stuff. Of course, this is pure speculation right now, and we've got no word on whether Apex Legends is coming to Nintendo Switch or not, but that should be the case for the existing platforms. Until then, we just have to sit tight and hope there's some news on the not-too-distant horizon! Need some more Apex Legends in your life? Check out this video on how to win with Pathfinder.